Whether you're converting a basement and need good storage for it, or simply shopping around for the best basement storage going for an unruly cellar, start by working out whether you want wall-hung for floor-standing storage. Floor-standing basement storage will be quicker and easier to install, but there may be issues around drilling into a tanked wall; wall-hung storage, on the other hand, will be neatly off the floor, handy if your basement or cellar is prone to flooding. In keeping with the store off the floor mantra, invest in some heavy duty shelving. Opt for ventilated, open shelving in durable metal or sturdy plastic (avoid wooden units as any damp that might lurk in your basement could damage and warp it). These heavy duty shelves from Screwfix (shown in a shed, but you get the drift) are easy to assemble and have handy adjustable shelves. A basement can quickly become filled with precariously balanced boxes, the contents of which are a mystery. Going for clear lidded storage boxes that can be neatly and safely stacked means you never have to rifle through Christmas decorations to get to the ski gear again. If the boxes are airtight your possessions will be protected from mould spores and pests, such as moths or mice, too. These weathertight totes from The Container Store have strong latches and an airtight seal; they come in 12 different sizes so you can mix and match based on your storage needs. Top tip: Store the heaviest boxes on the bottom shelves or at the bottom of the piles to avoid an catastrophes when try to access them. For items that are an awkward shape or size and don’t fit neatly into a box, baskets are a good option. 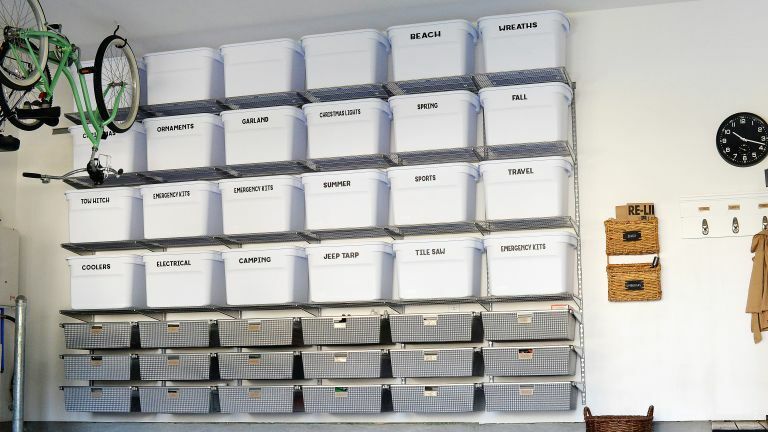 These wire storage baskets from Big Dug can be stacked to create a complete storage unit. They also come in four different sizes and dividers are available, so you can customise them based on what you are storing. Here, blogger A Bowl Full of Lemons has used a clear labelling system to organise her garage. Come on, you have got to admit that is one satisfying picture. And if organisation really is your thing, check out her Instagram. If you are lacking in floor space, use heavy duty hooks and overhead racks to make use of ceiling space. Overhead storage is more suited towards lighter items, so use it to get those awkwardly shaped or longer things out of the way. Think skis, planks of wood, Christmas trees, spare piping, ladders, surfboards. These overhead racks from Garage Flex have open mesh shelving up you can easily see what’s stored up there and take a maximum weight of 19kg. If you are an occasional DIYer and use your basement as a workspace, a fold down desk offers a sturdy surface that tucks out of the way when it is not in use. You can then use the wall space above to mount shelves, pegboards and hooks to store all the tools you need to keep accessible. This wall unit already comes with handy built in storage, and it may be shown as a study space, but we envision it filled with DIY paraphernalia. Choose a basement shelving storage system that can be customised to maximise your space. Elfa’s systems are perfect for basements as they are completely flexible and provide so many types of different storage – shelving for larger items, baskets, pegboards, tool hooks and drawers can all be added. Need bike storage? Bikes can be one of the bulkiest items in your basement, so save some space by mounting bikes on hanging racks instead. This bike holder from Cuckcooland (below) would be great for your most used bike - or the one that you just really want to show off - but if you have multiple bikes to store then a multi-bike rack would be a good alternative. If your love of wine has overflowed from the small wine rack in kitchen to the larger wine rack under the stairs and then to the even larger wine rack in the garage, the basement is your next best bet for stowing just a few more bottles. This modular wine rack from A Place For Everything comes in units, each storing up to 10 bottles. They can easily be stacked to accommodate as many bottles of wine as you need storage for. You can even go floor to ceiling should you wish - no judgement here. So you keep saying you will have a cull of your vast shoe collection, but who are you kidding? If you simply can’t let go of your assortment of strappy kitten heels - we all know they are going to have their moment again - then get some added shoe storage for the basement. Opt for closed storage to protect shoes from any damp or dust. A tall, narrow design like this cabinet from Habitat is great if you want to keep as much floor space free as possible – it also comes with the option of three or five shelves.